Many of you have certainly been “stunned” by all of the new RGB effects on computer hardware these days. By stunned I mean, blinded by dazzling rainbow lights to the point that you vision blacks out and your body freezes in place from the shock. As for me, well, I enjoy being stunned by a vibrant array of LED colors. 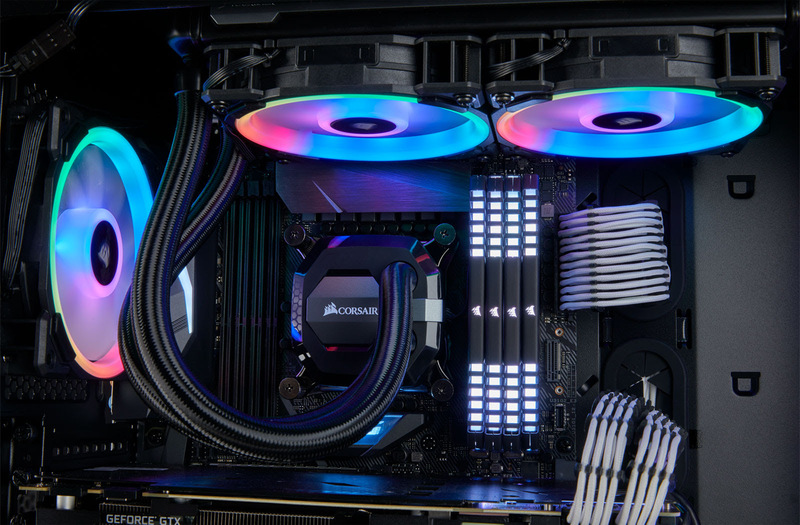 Corsair has taken the next step by adding an internal ring of RGB glow to the LL series of fans. Sure, some people think the RGB is a bit much, but as always, I’m super excited by the effect the lighting has on the blades. When will someone get a full spectrum wave RGB LED 200mm fan? Fremont, CA – October 12th, 2017 – CORSAIR®, a world leader in enthusiast memory, high-performance gaming and PC components hardware today announced a new addition to its acclaimed range of RGB cooling fans, the LL Series. 16 Brilliant independent RGB LEDs encircle each LL series fan and its central hub (12 LEDs in the outer loop and four in the inner), all controllable using CORSAIR LINK software to create a stunning symphony of color. Choose from a huge variety of stunning customizable lighting effects and patterns using CORSAIR LINK software to make your PC standout like never before, or synchronize fan lighting to system temperatures for at-a-glance information. Designed to run as quiet as their colors are bright, each LL Series fan utilizes precise PWM control and low-RPM operation, so they’ll be seen, but not heard. Combining class-leading RGB lighting and quiet operation, glow with the flow with LL Series RGB fans. CORSAIR has managed to pack even more stunning RGB lighting into the LL Series, with both a 12 RGB LED loop around the fan’s edge and an internal four RGB LED loop, creating a virtually limitless amount of color options. The included CORSAIR Lighting Node PRO allows for in-depth software lighting control for up to 12 CORSAIR RGB fans or eight CORSAIR RGB Lighting strips, making it easy to tie all your PC’s RGB lighting together. With CORSAIR LINK software. So go ahead and turn the lights on, you’ll want to see this. 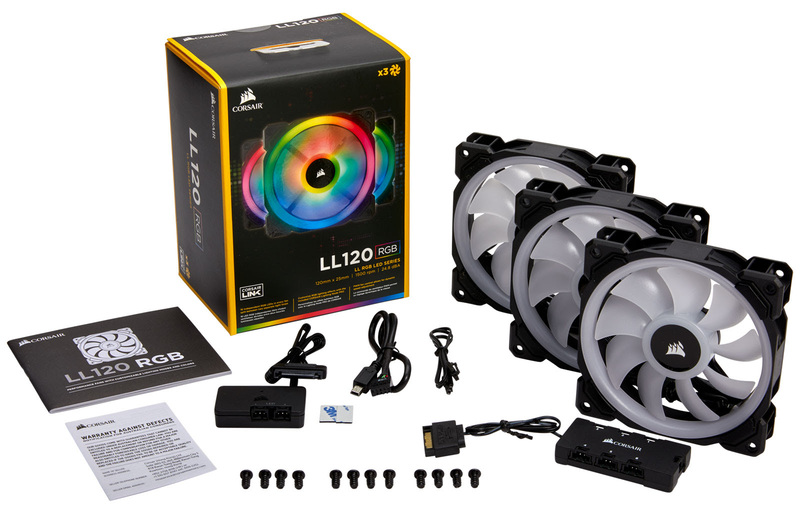 Available in 3x 120mm kit, 2x 140mm kit or individually**, combine LL series fans with existing CORSAIR RGB fans*** and lighting strips, to create your perfect custom RGB cooling setup. The customization doesn’t stop at color; every LL Series fan has PWM fan control, allowing for dynamic speed adjustment between 600 RPM to 1,500 RPM on LL120 RGB fans and 600 RPM to 1,300 RPM on the larger LL140 RGB. Whether you need maximum cooling or stealthy operation, with PWM control, you can instantly switch from low-noise to peak airflow. CORSAIR LL Series RGB fans are available immediately from the CORSAIR network of authorized retailers and distributors. CORSAIR LL Series RGB fans are backed by a two-year warranty and the CORSAIR worldwide customer support network. For up-to-date pricing, please refer to the links below or contact your local CORSAIR sales or PR representative. Copyright © 2017 CORSAIR Components, Inc. All rights reserved. CORSAIR, the sails logo, and Vengeance are registered trademarks of CORSAIR in the United States and/or other countries. All other company and/or product names may be trade names, trademarks, and/or registered trademarks of the respective owners with which they are associated. Features, pricing, availability, and specifications are subject to change without notice.